Mobile Sports Authority Intercollegiate at Magnolia Grove Crossings course, Mobile in Alabama. 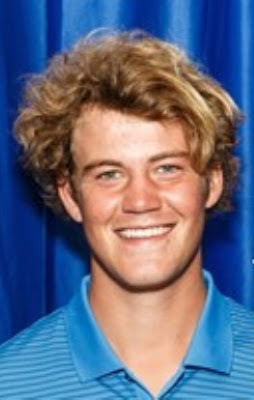 They were Walker Cup player and last year's British amateur champion Harry Ellis (pictured above) from Southampton and Jamie Li. Ellis had three rounds of 69 fpr 11-under 205, an aggregate matched by Li's scores of 68, 69 and 68. The Golf Stat website scoreboard does not say if (a) there was a play-off and (b) if there was, who won it .... one of the most infuriating features of Golf Stat coverage. You would think they would give the final result, wouldn't you? If you know who won the play-off if there was one, Email the info to Colin@scottishgolfview.com. It was a squeaky tight finish at Mobile with the third-placed Billy Tom Sargent (Western Kentucky) finishing only one shot behind Ellis and Li with scores of 69, 68 and 69 at the head of a field of 80 players. Sargent team-mate Stuart Easton, pictured left, a third-year student from Irvine, Ayrshire finished T20 with a total of two-over-par 218, made up of scores of 75, 69 and 74. A double bogey 6 at the 12th in his final round cost the Scot an even higher finishing place. He did birdied the fifth and 15th in that round. In the second round, Stuart had a hot outward half of 32 with birdies at the second, fourth, sixth and eighth. Another Western Kentucky student, Tom Bevington, a sophomore from St Albans, England, finished T67 on 230 with rounds of 77, 78 and 75. 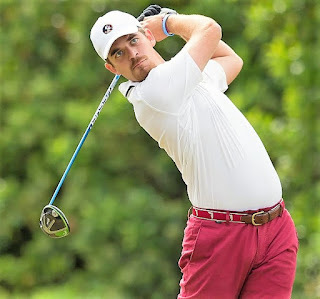 With four players in the top 10, not surprising that Florida State (834) won the team title by 16 strokes from South Alabama with Western Kentucky (858) a creditable third in a field of 16 teams. Scots Duncan McNeill from Annan and Joe Bryce from Bathgate helped Toledo University reach the final of the Earl Yestingsmeier Match-play college tournament at Lake Jovita in Florida. They lost the Championship match to Miami (Ohio) on a tie-breaker after it finished level at 3-3. Duncan, pictured right, who stands 6ft 4in, is a third-year student; Joe, pictured below left, a sophomore (second year). Also in the Toledo team was Thomas Thurloway, a sophomore from Crawley, England.